Why aren’t we talking more about the sustainability of water? When I was young, my Grandfather’s most frequent complaint was that the rain “stopped at one fence-line, leap-frogged our farm, and started again at the next fence-line.” If I hadn’t seen it happen so many times myself, I don’t think I would have believed him. Growing up in a farm family from arid Eastern Washington, I gained a great appreciation for every precious drop of moisture that fell from the sky. Each spring day, I am blessed with the opportunity to wake up in the midst of dusty, dryland wheat fields of Eastern Washington overshadowed by the majestic snow-capped Cascade mountains to the west and drive a few miles down into the scenic Columbia River Valley, passing blossoming apple orchards and the Rocky Reach Hydroelectric Dam on my way to the burgeoning city of Wenatchee. It’s both breath-taking and thought-provoking. 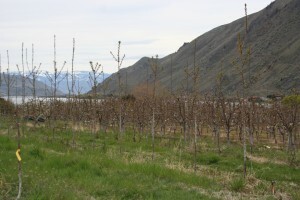 That occasional warm spring shower that provides desperate nourishment for the water-hungry wheat is making orchardists 6 miles to the west worry about fire blight in their apples and is accelerating the melt of the mountain snow we will depend on to irrigate this desert later this summer. It seems to have been in vogue to complain about the rain (either getting too much or not enough) as long as humans have inhabited the planet, but I wonder how often most of us actually stop and think about how critical the delicate hydrological cycle is to the sustainability of our Pacific Northwest agriculture and food system? Water has defined our agroecological systems in Washington State. From the rain-fed rangelands and wheatfields of Eastern Washington, to the irrigated specialty crop production regions of Central Washington’s river valleys and Columbia Basin, to the fertile river valleys and plains of Western Washington. Much of what we grow is dictated (both as a limiting factor and an opportunity) by the combination of the arid, Mediterranean climate and the heterogeneity and bounty of water. Wheat is King in Eastern Washington both because it “fits” the existing climate and moisture regime and because we have invested so heavily in developing wheat production systems that flourish in a variety of moisture regimes across the state. The central river valleys and the Columbia Basin can grow so many different types of specialty crops (fruits, vegetables, forages, etc.) and we can be a world leader in organic production, because the dry climate helps us manage diseases while the vast water resource from the Cascades provides a renewable water supply for irrigation. Even in the cooler, fertile river valleys and plains of the “wet-side” of the state, the availability of water for supplemental irrigation in the heat of summer is necessary to provide fresh, local produce from farms on the periphery of our urban centers. What will happen as the delicate hydrological balance we depend on is affected by global changes – climatic, economic, and political? We already have several areas of the state with existing water resource constraints – Yakima, Okanogan, Walla Walla and Odessa. In less than two years the conversation will open about the future of the US-Canadian Columbia River Treaty that governs operations of the major dams on the Columbia. Climate change projections both within our region and globally indicate that we will see changes in the stability of our regional water supply and that of other key food producing regions. While there are deep and critical conversations occurring within some segments of the “water community”, it seems that the dialogue about of the seriousness of water resource issues in the context of sustainable food and agriculture just isn’t happening to the degree that it should be in Washington. Perhaps it’s time to start? WSU’s Center for Sustaining Agriculture & Natural Resources (CSANR) and State of Washington Water Research Centers (SWWRC) recently completed a collaborative study for the Department of Ecology’s Office of Columbia River. The purpose of this study was to provide a 20-year forecast of water supply and demand for the Columbia River Basin (http://www.ecy.wa.gov/programs/wr/cwp/forecast/forecast.html). The table below provides a snapshot of the severity of the water quantity issue we face and we hope that this study provides a scientific basis to catalyze public conversation regarding water resources in Washington. The scientists involved in the study made significant advances in the development of methodologies and tools for conducting this kind of research that have already led to additional research on water issues in the region. I am hoping that the community of people who care about sustainable food and agriculture will become active in that dialogue. Forecast increases in demands by sector from 2010 to 2030 in Eastern Washington. One thought on "Why aren’t we talking more about the sustainability of water?"